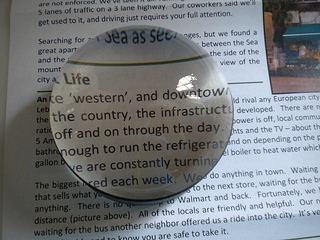 A dome magnifier is an ideal magnifier for reading newspapers, maps and magazines or for hobbies like stamp collecting. It's best used on a flat surface like a desk or table where the magnifier can glide over the material that needs to be magnified. These low vision magnifiers are also helpful for reading bills or documents. Resting directly on your reading material, they glide easily across any surface. They are heavy like a paper weight and can be used as one as well. 1. No need to hold it. Just glide the magnifier across the page. 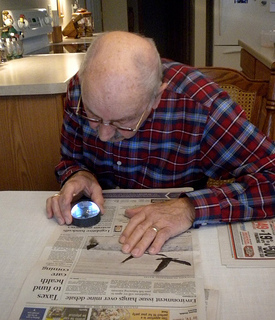 My father-in-law was using a lighted hand held magnifier to read the newspaper and now always uses the dome magnifier with his newspaper lying flat on the kitchen table which is near a nice large window. 2. No need to adjust it. With a hand held magnifier just the right distance from the page and the reader's eyes is critical for clear, sharp focus. The dome type magnifier provides clarity without the need to position it just right. 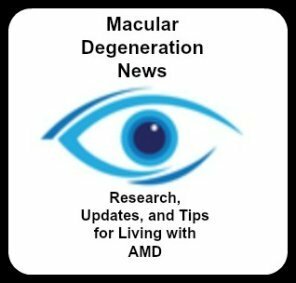 Please keep in mind that as your macular degeneration progresses, you will need to try an assortment of magnifiers to find the ones that work best for you or try a combination of reading aids. My father-in-law likes the combination of a large print book and a dome magnifier for easier reading. He says his eyes still get tired after about 30" to 45" but the two work well together for him. Size of Dome ranges from 2" to 3.5"
We purchased the 2.56" one but a 3.5" is large enough to read a column of the newspaper. The larger the magnifier the more expensive it is. Use it on a flat surface such as a desk or table. Allows ambient light to flow through from all surfaces to illuminate your reading material. My father-in-law likes to sit at the kitchen table by a big window for lots of natural light. 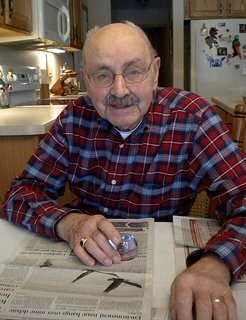 His magnifier came with a large, black rubber band around the bottom "for an easier grip." However once we removed the rubber band, he said more light came through. My father-in-law enjoyed going over old pictures, telling us who was in them and when and where they were taken, thanks to the magnifying power and clarity of his new magnifier. 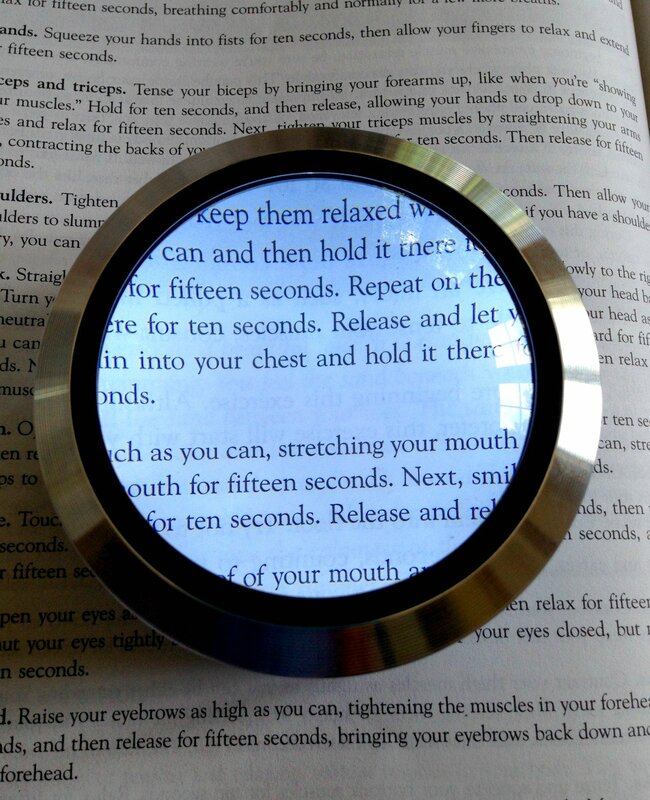 This type of magnifier is an ideal reading aid for those with macular degeneration. 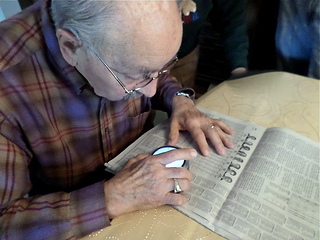 When the previous magnifier was no longer useful to my father-in-law who has wet macular degeneration we purchased a lighted 5X dome magnifier that has made all of the difference for him. He had stopped reading the daily newspaper but with the higher magnification and built in light, he is back enjoying his Milwaukee Journal each day and checking the Packer and Brewer scores. He had stopped reading the daily newspaper but with the higher magnification and built in light, he is back enjoying his Milwaukee Journal each day and checking the Packer and Brewer scores. There are 3 LED lights that really light up the reading material. Simply press down on the magnifier to activate the light. It has a 5 minute auto timer that automatically turns the light off. The magnifier has a 3" diameter lens and 5x magnification. It requires two CR2016 button cell batteries which are included. A black case comes with it to protect the glass and for easy portability. Included is a microfiber cleaning cloth to remove any smudges or finger prints. Take it with you when traveling or going out for the day. 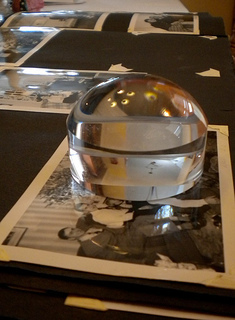 Enjoy your favorite newspaper, magazine or old pictures with magnification and clarity.